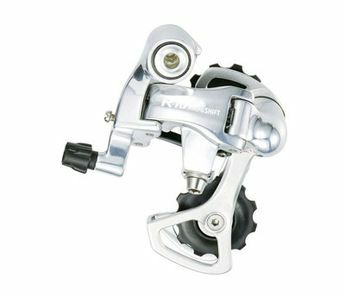 The MicroShift R10 2/3x10 SilverTen Speed Rear Derailleur is compatible with both standard 10 speed Crank sets from Shimano. Lightweight at only 218g and like all products from MicroShift, it has been well designed to be both durable and strong. Made from forged aluminium, that is then skillfully CNC machined to produce this fine finished product from the MicroShift brand name. The short cage option is compatible with 2x10 double chainrings and the Long cage option is compatible with either, 3x10 50/39/30T, 3x10 52/39/30T chairing options. This model is available in two cage options either Short or Large.